That our daughters may be as cornerstones, polished after the similitude of a palace. Coordinates: 40°26′57″N 79°55′33″W﻿ / ﻿40.44917°N 79.92583°W﻿ / 40.44917; -79.92583 Chatham University is an American university that has coeducational academic programs through the doctoral level, with its primary campus located in the Shadyside neighborhood of Pittsburgh, Pennsylvania, United States. Chatham University maintains its Chatham Eastside location at the corner of Shadyside and the East Liberty neighborhood of Pittsburgh. This facility serves the health science and interior architecture programs. In 2013, Chatham opened its Eden Hall Campus, located in the Pittsburgh suburb of Richland Township, to house the Falk School of Sustainability & Environment. The current university student population of 2,110 includes 1,002 undergraduate students and 1,108 graduate students. The University grants certificates and degrees including bachelor, master, first-professional, and doctorate in the School of Arts, Science & Business, the School of Health Sciences, and the Falk School of Sustainability & Environment. Founded as the Pennsylvania Female College on December 11, 1869, by Reverend William Trimble Beatty (the father of renowned operatic contralto Louise Homer), Chatham was initially situated in the Berry mansion on Woodland Road off Fifth Avenue in the neighborhood of Shadyside. Shadyside Campus today is composed of buildings and grounds from a number of former private mansions, including those of Andrew Mellon, Edward Stanton Fickes, George M. Laughlin Jr. and James Rea. It was renamed Pennsylvania College for Women in 1890, and as Chatham College in 1955. The name served to honor William Pitt, 1st Earl of Chatham and namesake of the City of Pittsburgh. The school gained university status from the Pennsylvania Department of Education on April 23, 2007, and publicly announced its new status on May 1, 2007, changing its name to Chatham University. With elements designed for the original Andrew Mellon estate by the Olmsted Brothers, the 39-acre (16 ha) Shadyside Campus was designated an arboretum in 1998 by the American Association of Botanical Gardens and Arboreta. It features over 115 different varieties of species, including Japanese Flowering Crabapple, River Birch and Kentucky Coffee Tree. In 2005 the University expanded its programs to include online advanced degree programs (bachelors, masters, doctoral) through the School of Continuing Education, now the School for Continuing and Professional Studies. Two years later, Chatham's MFA in Creative Writing program was named one of the top five Innovative/Unique Programs by The Atlantic Monthly. Chatham received some national attention in 2014 when it announced that it was engaging in a period of study "considering admitting men for the first time in that college's history," resulting in "reactions of surprise and anger" from its alumnae. The current president of Chatham University is David Finegold, DPhil. Dr. Finegold, a graduate of Harvard University and a Rhodes Scholar who received his doctorate from Oxford University, became the 19th president in 2016, following the retirement of Dr. Esther Barazzone after a 24-year tenure. The original Shadyside Campus is part of historic Woodland Road. The Shadyside Campus now includes Chatham Eastside, which serves as the home for health science and interior architecture programs. The University's new 388-acre (157 ha) Eden Hall Campus is located north of the city in Richland Township, Pa. and is the home of Chatham's Falk School of Sustainability & Environment. Programs at Eden Hall Campus include a Bachelors in Sustainability, a Masters of Sustainability, an MA in Food Studies, and dual degrees in Masters of Sustainability or MA in Food Studies + Masters in Business Administration. The Eden Hall Campus was donated to Chatham University by the Eden Hall Foundation on May 1, 2008. In 2011, the University engaged the architectural team of Berkebile Nelson Immenschuh McDowell (BNIM) of Kansas City, Mo. and the landscape design firm Andropogon Associates of Philadelphia to lead the master planning process. The first phase of development, which won an award for sustainable development was completed by the firm Mithun in 2016. The University structure includes three distinctive Colleges: Chatham College houses academic and co-curricular programs for undergraduate men and women and embodies the traditions and rituals of the traditional liberal arts college. The College for Graduate Studies offers women and men both masters and doctoral programs. Programs within the College for Graduate Studies include concentrations in art and architecture, business, health sciences, teaching and creative writing. The College for Continuing and Professional Studies, formerly the School of Continuing Education, provides online and hybrid undergraduate and graduate degree programs for women and men, certificate programs, and community programming including the Summer Music and Arts Day Camp. Chatham University teams, also known as the Cougars, participate as a member of the NCAA Division III. The Cougars are a member of the Presidents' Athletic Conference (PAC). Women's sports include basketball, cross country, ice hockey, lacrosse, soccer, softball, swimming & diving, track & field, and volleyball. Men’s sports include baseball, basketball, cross country, ice hockey, lacrosse, swimming & diving, track & field, and, beginning in fall 2019, soccer. Men's and women's ice hockey play in the United Collegiate Hockey Conference. The women's ice hockey team was the first NCAA women's ice hockey team in Pennsylvania. The college mascot was previously Pennsy the Seal. The cougar mascot was adopted in 1992 and was named Carson in honor of alumna Rachel Carson in 2011. Among Chatham's notable alumnae is biologist and zoologist Rachel Carson (1929), after whom the Rachel Carson Institute at Chatham is named. The RCI, as it is known, promotes understanding of environmental issues through conferences, lectures, discussion panels, and other methods. In honor of Rachel Carson's legacy, the University President, Esther L. Barazzone, Ph.D. and others led a campaign to rename the Ninth Street Bridge in Downtown Pittsburgh as the Rachel Carson Bridge. The naming resolution was passed by Allegheny County Council on December 6, 2005. The Rachel Carson Bridge is one of the "Three Sisters" Bridges, opened between 1926 and 1928, and designed by County architect Stanley L. Roush and the Allegheny County Department of Public Works. The Roberto Clemente Bridge (formerly Sixth Street Bridge) and the Andy Warhol Bridge (formerly Seventh Street Bridge) complete the trio of bridges. They are the only trio of nearly identical bridges and were the first self-anchored suspension spans built in the United States. They are among the only surviving examples of large eyebar-chain suspension bridges in the country. ^ As of June 30, 2009. "U.S. and Canadian Institutions Listed by Fiscal Year 2009 Endowment Market Value and Percentage Change in Endowment Market Value from FY 2008 to FY 2009" (PDF). 2009 NACUBO-Commonfund Study of Endowments. National Association of College and University Business Officers. Archived from the original (PDF) on 2017-12-14. Retrieved February 24, 2010. ^ a b "Athletics' mascot gets a new name". chatham.edu. March 31, 2011. Archived from the original on September 16, 2014. ^ "Chatham Eastside | Chatham University, Pittsburgh, PA". Chatham.edu. Retrieved 2017-03-13. ^ "Eden Hall Campus | Chatham University, Pittsburgh, PA". Chatham.edu. Retrieved 2017-03-13. ^ "Chatham Quick Facts". Retrieved 22 August 2017. ^ Grant, Tim (2007-05-01). "Chatham gains university status". Pittsburgh Post-Gazette. Retrieved 2009-08-16. ^ Delaney, Edward J. (2007). "The Best of the Best". The Atlantic Monthly. Retrieved 2009-08-16. ^ Schackner, Bill (2014-02-18). "Chatham University considers enrolling men as undergraduate students | Pittsburgh Post-Gazette". Post-gazette.com. Retrieved 2017-03-13. ^ Schackner, Bill (2014-02-19). "Coed possibility concerns Chatham alumnae | Pittsburgh Post-Gazette". Post-gazette.com. Retrieved 2017-03-13. ^ "President's Bio". Retrieved 22 August 2017. ^ "Chatham University Eden Hall Campus - Mithun". Mithun. Retrieved 2018-01-29. ^ "Eden Hall Campus receives American Institute of Architects Award for Sustainable Design Excellence". Chatham News. 2017-04-20. Retrieved 2018-01-29. ^ Ltd., Info724. "Middle States Commission on Higher Education". www.msche.org. Retrieved 24 September 2017. ^ "United Nations Academic Impact Members 2018" (PDF). academic impact. 2018-01-02. Retrieved 2018-01-30. ^ DeBonis, Mike; Davis, Aaron C. (January 2, 2015). "Muriel Bowser sworn in as D.C. mayor; pledges to make city healthier, safer". The Washington Post. 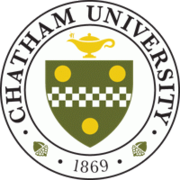 Wikimedia Commons has media related to Chatham University. "Pennsylvania College for Women" . Collier's New Encyclopedia. 1921. This page was last edited on 1 April 2019, at 05:13 (UTC).